Doing it Differently: Weekly Challenge #110: "Get rid of the box"
Exploring the world, through Art, Spiritualism, Polyamory, and the Love of Life. Here is my entry into the Weekly Challenge #110: "Get rid of the box"
I had to think about this challenge. I figured in order for me to get rid of the box, that I should step into it. The ways I stepped out are as follows. I decided to use a “Tile,” more often than not I do ZIA, so I selected the size I tend to avoid, and pulled out an official Tile. For the Border, when I do Tiles, I tend to use curvy lines, so I made the border a straight sided square. 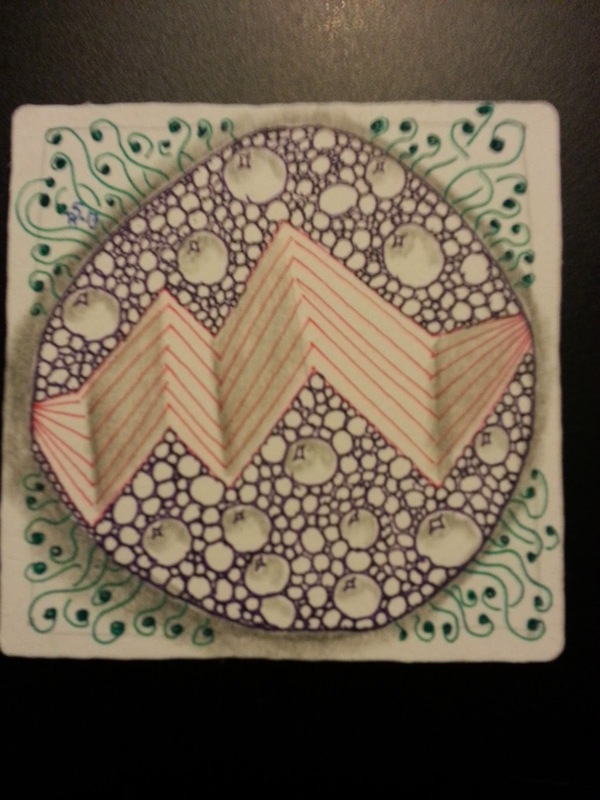 For the String, I thought about one I had not used before, and just added a large circle in the center of the tile. Then, I did the tangling in color. I still have troubles adding color, I “See” Zentangle® as black and white, so I have o force myself to use color. Lastly, I decided to make the circle a tangle I have not done before, I looked at my card in my kit, and found one I had not done. I am pleased with the results. Thank you Diva for another wonderful challenge. You should be pleased because it is definitely pleasing! Love the shading and the dimension! Certainly a tile to be pleased with! Nice to do something so diffretent isn't it!? Very nice. Your shading gives it lots of dimension. Thanks for all the wonderful comments! Your tile is great, you've used the color well! I am a Certified Zentangle Teacher, and could not be happier abut it. It is an art form I loved from the first class I attended. .
Zendala Dare - The Big 50!